With the introduction of the 'Insert HTML' feature in Editor, it opens up a whole array of very powerful formatting flexibility. The Insert HTML feature is available using the container/section widget. Once you drop your widget on the page in Editor, select 'Format' tab > 'Settings'. Scroll down to 'Section Settings' > Insert HTML field. 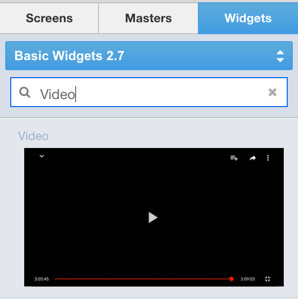 There is also a 'Video' widget available in Basic Widgets 2.6 & higher (search for 'Video'). Drag/drop this widget into your project's screen. Take a look at the corresponding HTML in the 'Insert HTML' box. You can edit this to include your own URL, size, etc. The following are just a few ideas for what you can do with HTML. Feel free to try simple or advanced HTML in your project. Learn more about HTML here. You can also combine the use of another new feature, Using CSS, to get even more flexible and dynamic with your projects. Here's a short video to show you the basics of adding HTML to your prototypes in Editor.